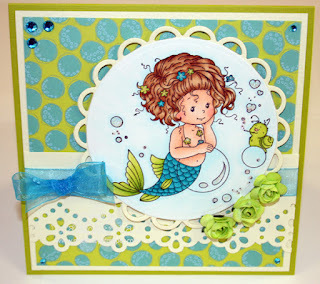 It is so easy peasy to coordinate and make a well designed card using products from one collection. I stamped my image with Memento Espresso Truffle ink and cut out the focal image with a couple of Spellbinders nestabilities. DP and jewels are from the Bo Bunny Little Miss Collection. All products are available at One Crazy Stamper. 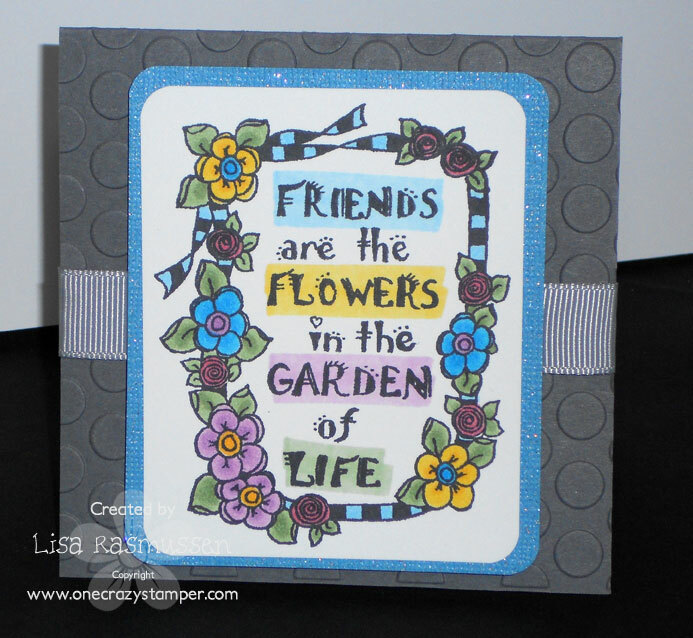 Hi everyone Cindy here Welcome to my One Crazy Stamper project. Today I used Fancy Birdhouse by High Hopes. Hi all, Madge here for another Wonderful Wednesday at OCS. Can you believe it’s almost the end of June!! I’ve chosen to use a stamp called “Missie”, a Kraftin’ Kimmie stamp available at OCS and made it into a Pop-Up Surprise card. Here it is flat, folded and ready to mail. When you pull the bottom tab, “Voila”, a hidden message that also allows the card to become free standing and the image and side DSP pops away from the card. Supplies used: "Missie" by Kraftin' Kimmie/ Memento Tuxedo Black ink; Xpress It blend Cardstock; Copic Markers; DSP from Authentique DS 6 x 6 pad; EK Success Musical Note Punch; misc. Pearls, colored with copic marker and black cardstock. Hope your day is a great one! – Remember Stamp up a storm, ink up a wish and send it on to someone to make their day! Congratulations, please contact me at s.mclaughlin8@shaw.ca so I can get your prize to you. This week I have a tutorial about coloring skin with Copic markers. When I color with Copics I always start with the lightest color covering approximately 60% of the area, leaving the highlight area blank. Using the middle color I recolor about 40% of the already colored area, and then finish with the darkest shade on 10% of the same area. After the three colors are applied, blend them all together using the lightest color. The following diagram shows some of my favorite color combinations for skin tones. I have listed the colors that I have used for each skin tone, but there are many others options - what is your favorite skin color combination? Do some experimenting with different color combinations and step outside of the box - you never know until you try, what wonderfully colorful results you can achieve!!!! Have fun playing!!! Wishing you all a very happy day!! 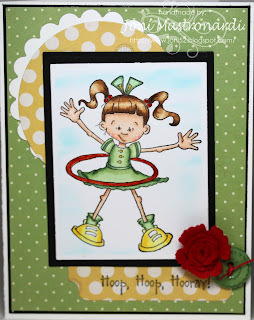 Today I have a fun summer image from High Hopes called Swinging Shannon for my One Crazy Stamper post. I colored my image with Copic markers and then fussy cut her leaving a narrow white border. I popped the image up on foam tape inside the frame for dimension. Sure to put a smile on any little girl's face! Be sure to stop by and see all of the fabulous High Hopes images Lora has added to the store! With it being the end of June, school will be out next Friday for the children which means that they will be home and There's No Place Like Home. 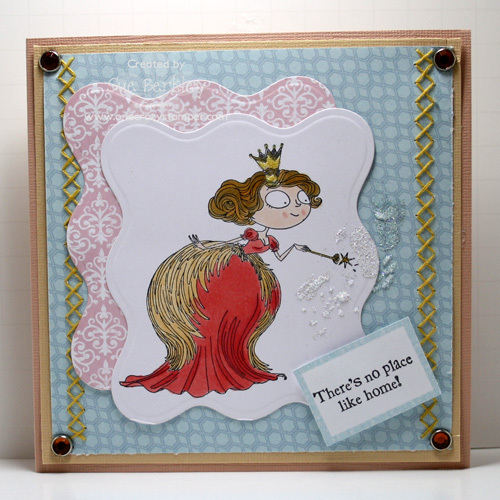 For today's post for OneCrazy Stamper, I have used Glinda the Good Witch from Kraftin' Kimmie. 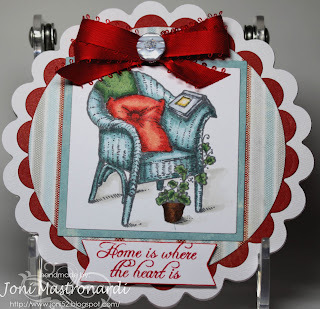 There are still a few days to enter this month's challenge for a chance to win a Heartfelt Creations Stamp set. See Lora's store One Crazy Stamper for some amazing products and deals. Well we had super hat weather last weekend where I live (over a hundred) and I was really getting worried about this weekend because I am participating in Relay for Life. This is a 24 hour event that is put on by the American Cancer Society. But thank goodness the weather is looking to be a beautiful 76! That is PERFECT weather and I am excited to be out there for the event. Of course with the hot weather I was able to stay cool in the A/C and craft. I used the adorable High Hopes Garden of Life stamp set. I love to color so this image is right up my alley! Hope you enjoyed! Have a wonderful week! 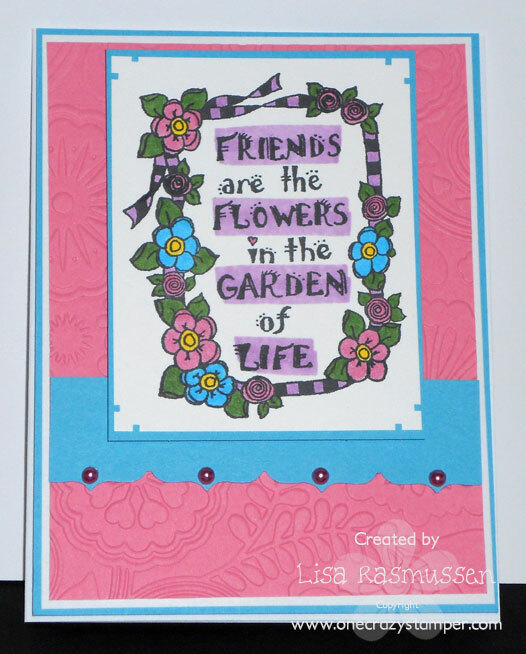 Today's card features Flourishes On the Porch stamp set available at One Crazy Stamper. I stamped the image with Memento Grey Flannel ink unto Xpress It card stock. I had so much fun coloring this image with copics:R12, R14, R17, BG75, BG72, BG70, G24, G20. I then cut the image with a square nestie and layered the squares unto a circle nesties. I made a shaped card using a Grand Calibur Scalloped circle. Our sketch challenge is still going on until the end of June. Check out the details here. Today is a no stamping card, (except for the sentiment). 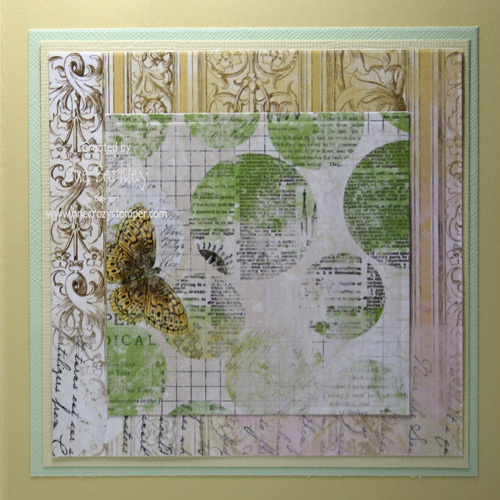 I’ve chosen to use an absolutely gorgeous die from Lora’s store, called Exotic Butterfly. They are classified as “small”, but au contraire…….they are absolutely perfect. AND, there are THREE (3) in the pack - what a deal!! AND they are absolutely drop-dead gorgeous. So intricately beautiful together or all on their own. Supplies used: Exotic Butterfly (set of 3); Rhinestones; Misc. Cardstock; Sakura Stardust Pen; Brads; Spellbinders Ovals. Simple, Quick and exotic! “Remember, stamp (or cut) up a storm, ink up a wish and send it to someone to brighten their day”. Good morning everybody!!! As I post this it is in the early hours of the new day , and as usual I'm up late working on new projects, but most of all I had a wonderful evening coloring with some very special friends!!! It's Terrific Tuesday time here at One Crazy Stamper, and my card features a sweet Stampavie image by Penny Johnson entitled "Sweet Dreams". The image is stamped with Memento Rich Cocoa, then colored with Copics, with the light source being the candle. Dp is from My Mind's Eye Lost & Found - Sunshine collection, the doilies are inked with either Walnut Stain, or Brushed Corduroy Distress Ink, and the ribbon is from my stash. An Impression Obsession Clear Rubber Stamp set "Dare to Dream" provides the sentiment. The image "Storybook Friends" is also from Stampavie, and as a special little surprise, One Crazy Stamper has provided this image for me to give away this week. As an added bonus, I will also send the winner the stamp used to make this weeks card, so if you would like to win please leave a comment on my post today. The winner will be announced on my post next Tuesday. Today's post features Summer's Sweetness. This adorable summer-y image is by High Hopes. For the background I used the Copic Airbrush and the image is colored with Copic Markers. Love the look of the airbrush on the Nestabilities. Designer Papers by Cloud9 Design and American Crafts Baby Collection. 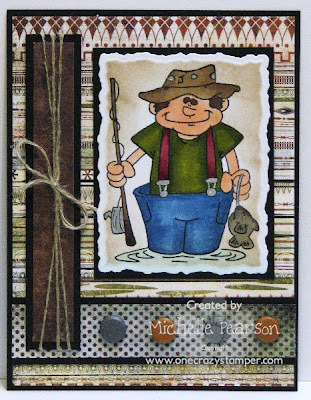 For this card I used a different color pallet and a touch of faux stitching to add some detailing. Isn't it amazing what changing the colors does to an image?! 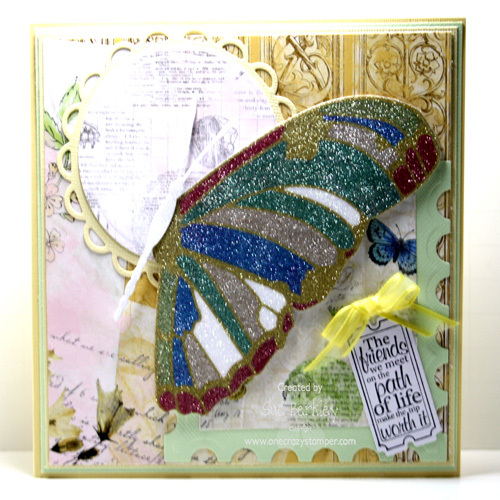 The butterflies are from Flitter~American Craft's Backyard Collection...I love them! The lower border punch is Fiskar's Threading Water Punch. Thanks for taking a peek! Be sure to pop on by the store to see what's new....it's always a good excuse to grab a cuppa and sit a bit! Enjoy! 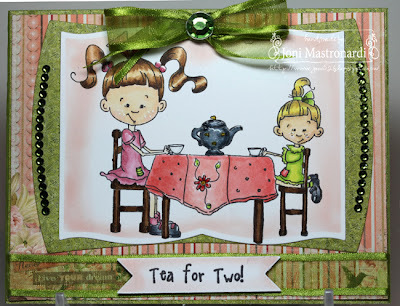 For my post today for One Crazy Stamper today, I have used this adorable image called Sweet Picked designed by Elisabeth Bell for Whimsy Stamps. There is still time to enter this month's challenge which is a sketch for a chance to win a Heartfelt Creations stamp set from OCS. I used a super cute stamp My Favorite Things--The Rainbow Will Come. I love how much fun it was to paper piece! I used copics and colored directly on the Kraft Paper. Kraft does change the color a bit so I would recomend printing out a copic sheet on kraft as well as the white paper you use so you can get a true color match. Happy Father's Day to my son-in-law Josh, who now has a baby girl, Gia, born June 5th. Now Jana and Josh have a boy and a girl, so this image is perfect, except the boy is older than the girl. 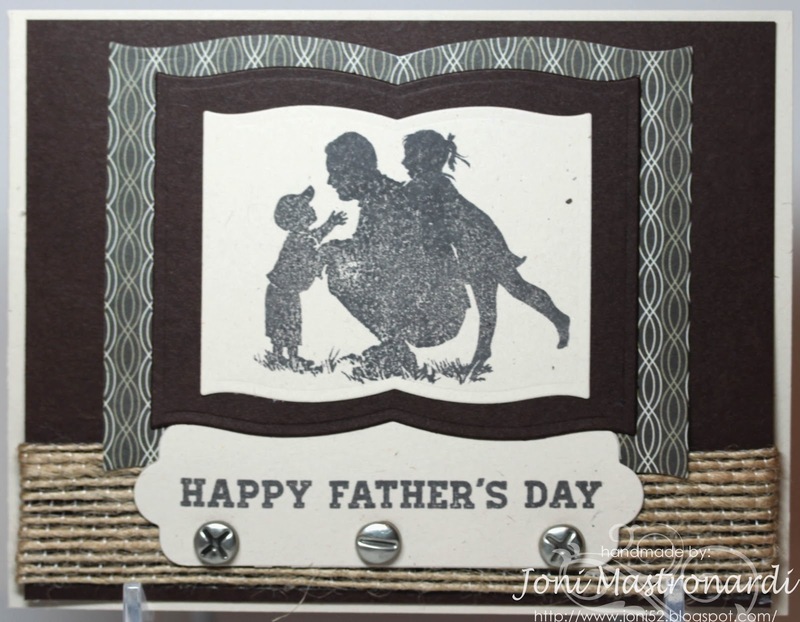 This lovely silhouette image by Flourishes is called Father's Day and it is available from One Crazy Stamper. I stamped the image with Memento Espresso Truffle ink onto craft cardstock. 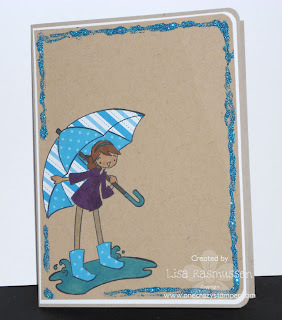 Check out our blog and join in the fun on our sketch challenge. Hi everyone Cindy here Welcome to my One Crazy Stamper project. Today I have used Fancy Birdhouse by High Hopes. My paper is from My Minds Eye - Follow Your Heart Be Happy Paper Pad. Lace is a Martha Stewart punch, doily a Marianne Design. Added some Pearls and a bit of stitching. Friends are always there for you! Hi all, Madge here for another Wednesday. I hope it’s a wonderful Wednesday for all of you. I’m sitting inside snug and warm in our 5th wheel at the lake. We just weathered through a torrential downpour. . . . . oh my, will summer ever come?? Today, I’ve got a sweet little card to show you – using a House Mouse Stamp called Chewable Aspirin. Some days all you need is an aspirin and a friend to make your day better – Right??!! Stamp: Chewable Aspirin; Spellbinders, Romantic Rectangles; Xpress It blend Cardstock; Copic Markers; Tim Holtz Distress inks; My Mind's Eye "Follow Your Heart" 6x6 pad; Flowers; misc. cardstock and a cotton ball, from stash. Hope your day is brighter already! “Remember, Stamp up a Storm, ink up a wish, and send it on to someone to brighten their day”. Time for Terrific Tuesday here at One Crazy Stamper and this week I just could not resist coloring these two adorable images from CC Designs!! This is Honey Bee-trice and Woodland Daisy colored with Copics in a most unusual color combination for a cute little bee. I stamped and colored Honey twice, so that one of the images could be fussy cut and popped up on the original image. The antennae and flower center have been flocked, wings have a coat of Smooch Top Coat Illuminate paint to make them shimmer, and the small flower centers and dots on the sentiment were highlighted with Stickles Fruit Punch. The dp is from Teresa Collins Sweet Afternoon collection, while the bakers twine and flower are from my stash. The white spots on her cheeks are done with Copics Opaque White paint. You still have lots of time to enter for a chance to win a fabulous prize here at the One Crazy Stampers challenge blog, by following the monthly theme which is a Sketch. Check out the rest of the design teams wonderful creations, and make sure to stop by the One Crazy Stamper brick and mortar store or the online store here, to find all of the wonderful products featured here, plus much, much more!!! 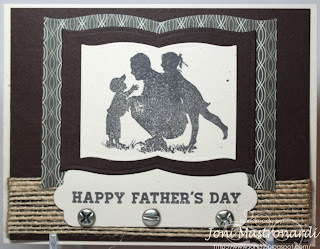 Today I'm sharing a card for One Crazy Stamper using High Hopes' stamp Dad's Catch. I colored the image with Copic Markers: E47, E44, E43, E11, YG97, YG95, B97, B95, R59, R56, W5, W3, BG10, B000. 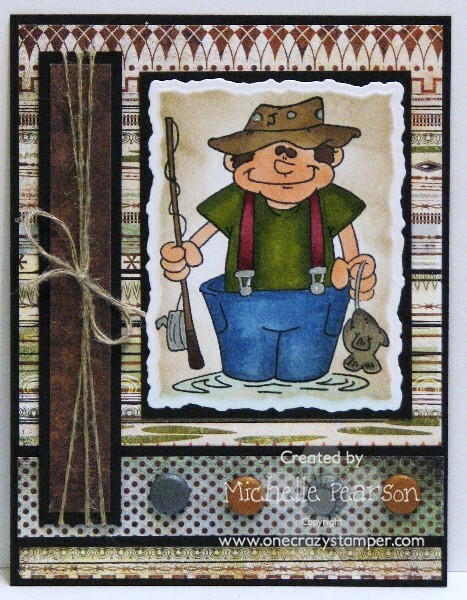 Image is cut out with Spellbinders' Deckle Rectangle and distressed with Tim Holtz' Frayed Burlap Distress Ink. I embellished my card with some linen thread and Candi embellishments. It is a gorgeous, hot and humid Sunday here. For today's post for One Crazy Stamper I definitely went outside of my comfort zone -- time to spread the wings. 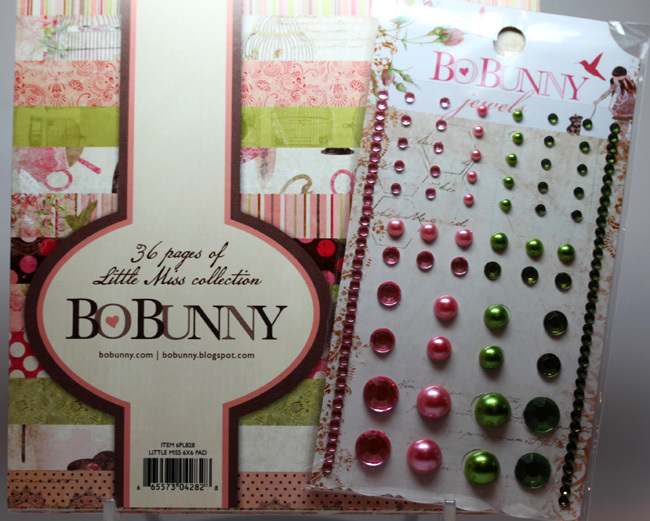 No copic markers were used and the only stamp used was the Whimsy Ticket Notes Sentiments with the Ticket Die. I even added DP to the inside of the card which I never do. 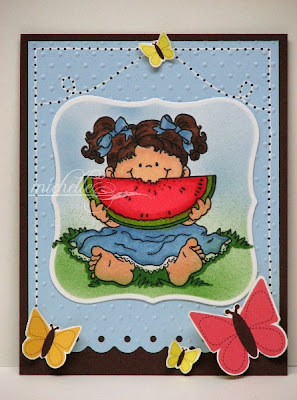 I put some of the Be Creative Tape on X-Press It Cardstock and cut the shape out using the Selena Butterfly. I took off the top layer of the shape and used it to cut out the Maribelle Butterfly out, which I then put on the original cut out. I added one colour at a time by removing the individual sections. Do go out of your comfort zone and let us see what you create for this month's challenge. You have until the end of the month to be creative for a chance to win a Heartfelt Creations stamp set. 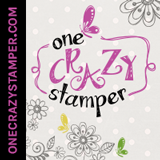 Check out Lora's store One Crazy Stamper for some amazing deals. Soooooo sorry for the late posting! I thought I had scheduled this and with all of the blogger problems I try to check the next day and glad I did because their was no post from me! But I'm here! I used Garden of Life by High Hopes! I was a little scared when I started to color but it was soooo easy and fun! Their are soooo many different options to color and I am thinking trying watercolor next with this adorable image. Today of course I used copics! Today I have a Product Spotlight from One Crazy Stamper. If you want to have a well coordinated card with lots of different papers, use a 6 x6 paper pad. All your papers are already matched for you. 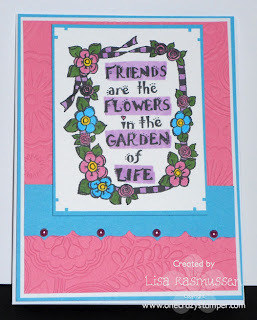 For today's card I used Summer Fresh by Simple Stories. Check out all the 6 X 6 paper pads at One Crazy Stamper. I added a red felt flower and green button for embellishments. June Guest Designer Marcie Sharp! 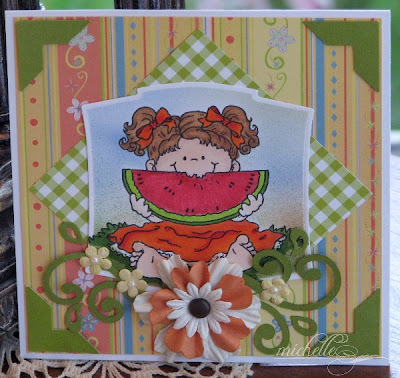 Today I have a super cute card to show you from our June Guest Designer Marcie Sharp! I love the papers she’s used and especially love the paper piecing! Here is the supplies Marcie used from the OCS store on her card! Thanks for joining us this month Marcie and Thanks for your gorgeous contributions on the OCS blog! I have this lovely image from Whimsy called "Goldie" for you today. 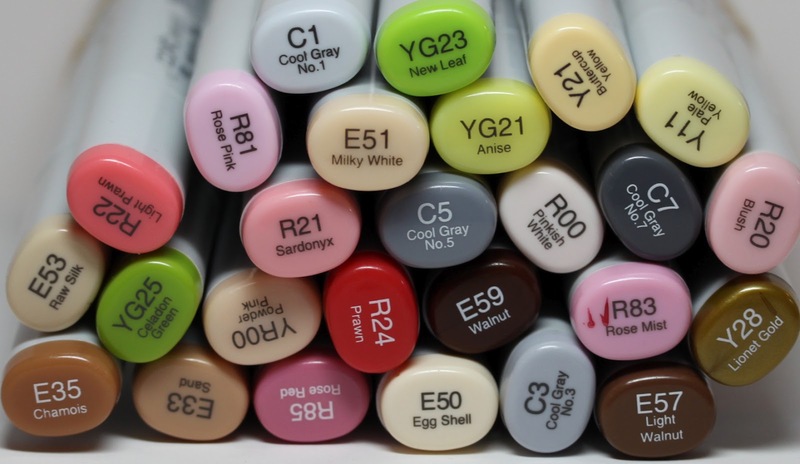 All the details are up on my personal blog including Copic colours. You can find the post HERE!